Possess the timeless charm of Shaker inspired furniture while adding the ability to spin at your table in our Amish-made Coupeville Swivel Bar Chair. Made entirely of the domestically grown, responsibly harvested hardwood you select, your Coupeville Swivel Bar Chair can be whatever you design. 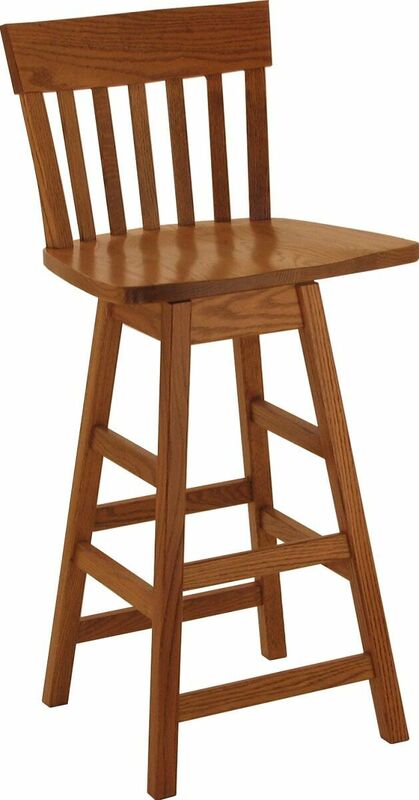 Our Amish artisans will take your choices in wood, stain, and height and handcraft the pub chair you design for your home or place of business. Mortise and tenon joinery, catalyzed conversion varnish, and expert craftsmanship ensure a long working life for your Coupeville Swivel Bar Chair. Shown in Oak, these chairs are also available in Brown Maple, Cherry, Quartersawn White Oak, Hickory, and Maple.